Amylulita says...: Go Go Gangerster Cumbia Party 2nite! 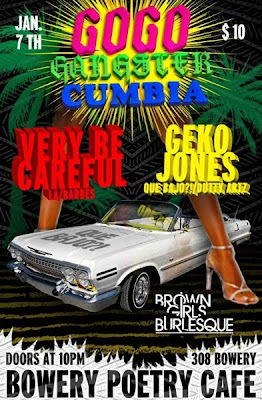 Que Bajo compadre Geko Jones is joined by LA's Very Be Careful for a night of full on Gangster-Cholo themed debauchery. Go Go Gangster Cumbia brings together all the fun and sounds of the Que Bajo parties with Go-Go and Burlesque dancers, live music and a 1930s gangster costume theme. This is going to be insanely fun party celebrating the return of one of NYC's favorite nightlife promoters. Special thanks and Happy Birthday to Katie Dugan for helping put the theme of the night together. Let's do it!